Some people, mostly English teachers I’m guessing, might act like they are about to have a heart attack if you would suggest burning – or for that matter rewriting – any of Shakespeare’s plays. For the sake of history and the literary cannon I guess I would agree. But for the sake of this game this is exactly what I’m going to ask you to do. Pick any of Shakespeare’s plays and let us know which one you would read (favorite), rewrite (something needs to be tweaked or changed), and burn (come on some of them are pretty messed up and/or boring). Whether it’s making Juliet live and end up with Benvolio or your secret hatred of Hamlet and his whiny ways I’m excited to see which plays you choose for which spots and why! Read: Much Ado About Nothing – this is my all time favorite. “I wish my horse had the speed of your tongue.” Enough said! Rewrite: The Taming of the Shrew – there are some funny lines in this one, but I think we can all agree it needs a feminist overhaul where Katherine gets revenge on all the men who tried to “tame” her. Burn: Coriolanus – I hated this one so much when I read it in my college Shakespeare course. I personally don’t think that many people would miss it if it mysteriously didn’t exist anymore. Can’t wait to see what plays you choose! This entry was posted in Marry Date or Dump and tagged books, Shakespeare by Alison Doherty. Bookmark the permalink. I’m an English teacher and I have literally never heard of Coriolanus ever. So.. to burn it is. You are lucky … that one is definitely a dud (in my opinion). Rewrite: The Tempest to make his daughter have more agency in her love story, more clues to how she’ll be a good queen. Also more on that backstory of Ariel’s because I want to know. And Richard III could do with some tweaking. Love all of these picks, and especially agree about giving more agency to Miranda in The Tempest. 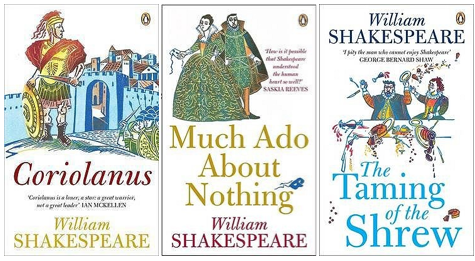 I was definitely torn between choosing King Lear (which I think is a basically perfect play) and Much Ado About Nothing (which is my favorite) to read. Thanks for playing! I’m going to say burn the others and read/love/reread A Midsummer Night’s Dream! 🙂 That’s my favorite one. Okay. I’ll also take Much Ado about Nothing – love that one! Whoa that’s a radical move. I’m also a big Midsummer Night’s Dream fan. It was the first Shakespeare I read and the first one I acted in. So cool! Who’d you play? ?